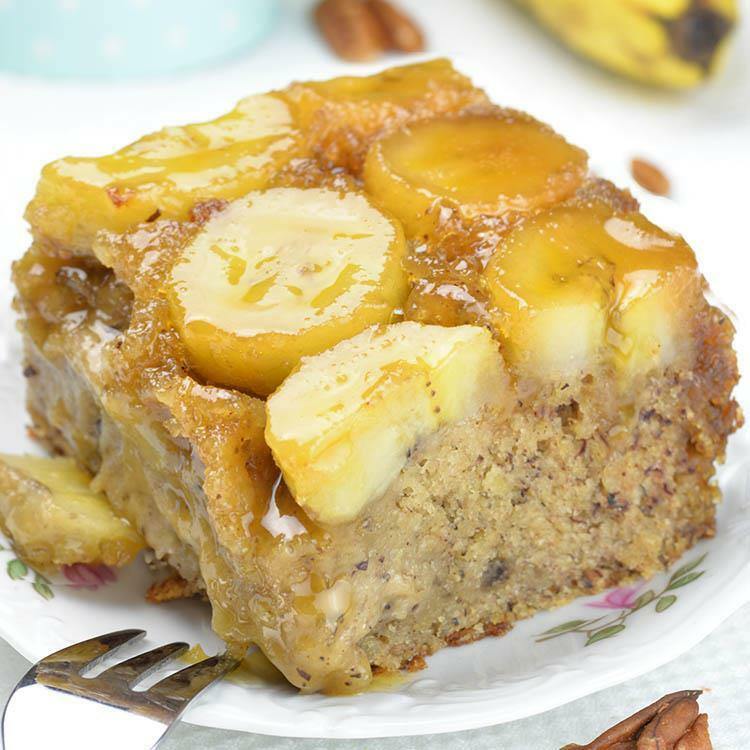 Banana Upside Down Cake is incredibly moist and flavorful dessert, but it could be great breakfast or snack, too. You can’t go wrong if serve piece of this cake with toasted pecans and caramel sauce on top. Or maybe you are more for classic Chocolate Chip Banana Bread?! 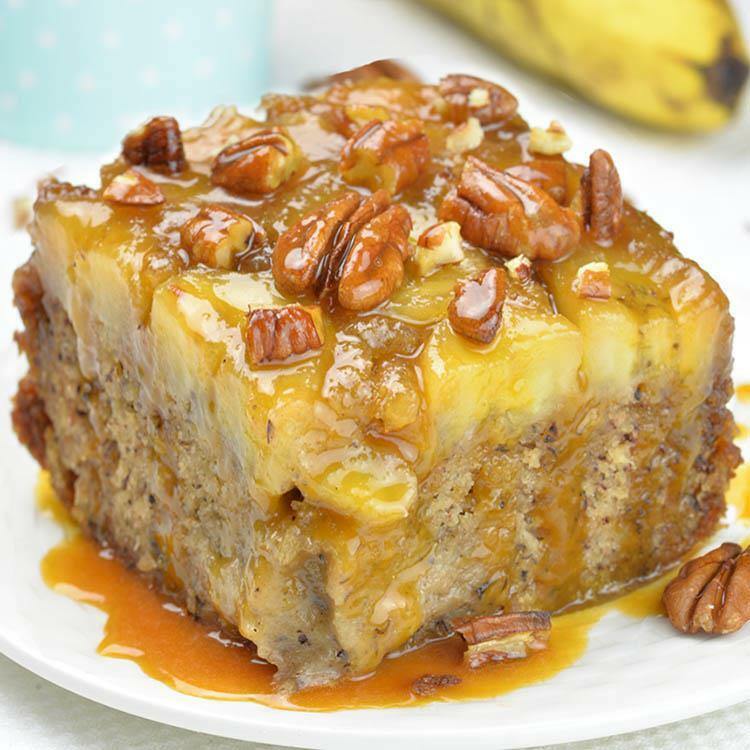 This delicious Banana Upside Down Cake has rich flavor thanks to mashed bananas in the batter and a layer of banana slices in caramel sauce on top. This cake could be breakfast! It’s rich and dense cake, but very moist at the same time. It’s something between bread and a cake, different from this equaly delicious Custard Cake. My favorite part is caramel. It matches perfectly with banana flavor. First, there is sticky butter and brown sugar topping that caramelizes as the cake bakes. That’s what I love about every upside down cakes. But there’s more of caramel in this Banana Upside Down Cake. When I inverted the cake on the plate I topped it with caramel glaze. It’s just simple mixture of butter, heavy cream and brown sugar. This caramel glaze firm up as it cools, so I saved some and reheat it, then drizzle onto each slice. Also I couldn’t resist adding chopped pecans on top. Caramel, pecans and banana go hand in hand. And if you want to make it extra special you can top it with a scoop of whipped cream or vanilla ice cream. However if you eat it for breakfast, don’t overdo it with the topping. After all, breakfast should be healthy. 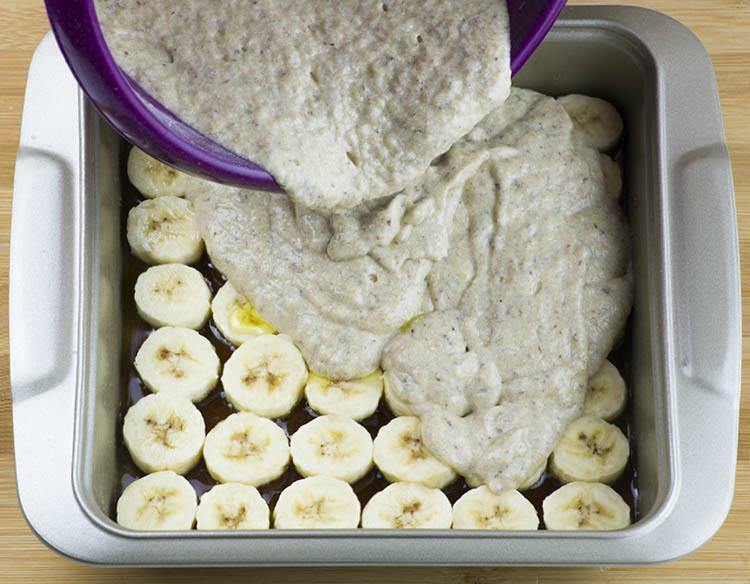 If you have ripe bananas to make use of, I recommend you this recipe. Though if you are not a fan of bananas and your favorite part of each upside down cake is sweet,sticky and buttery brown sugar topping, you should definitely check my Pineapple Upside Down Cake. It has triple dose of this yummy goodness. Three cake layer, each top with caramelized fruit. Just imagine how tasty this might be. 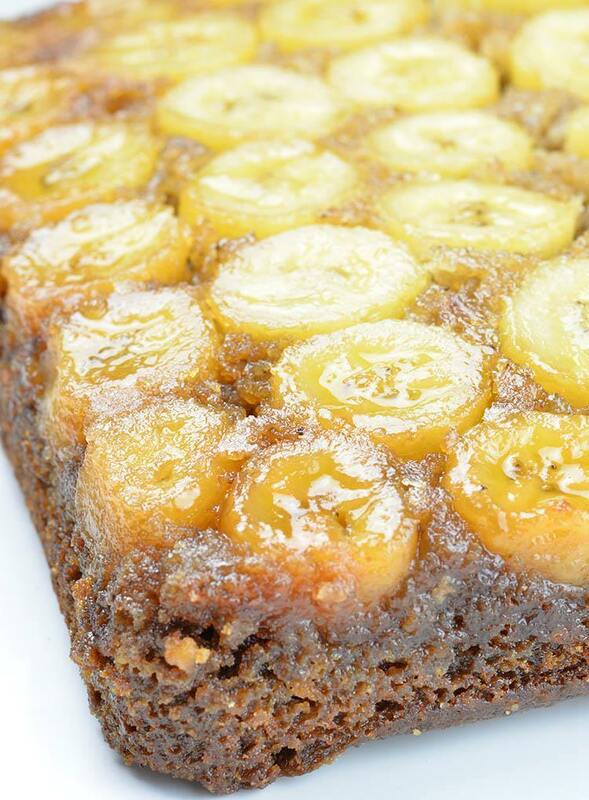 Upside Down Banana Cake is incredibly moist and flavorful dessert, but it could be great breakfast or snack, too. In a saucepan combine butter, brown sugar, heavy cream and salt and bring to boil over medium heat stirring constantly. Simmer for 2-3 minutes, remove from heat and let it sit for 1-2 minutes. Pour 2/3 of the glaze over the banana layer. Reserve leftovers of the caramel glaze for serving. Ahhh this cake looks unbelievable! 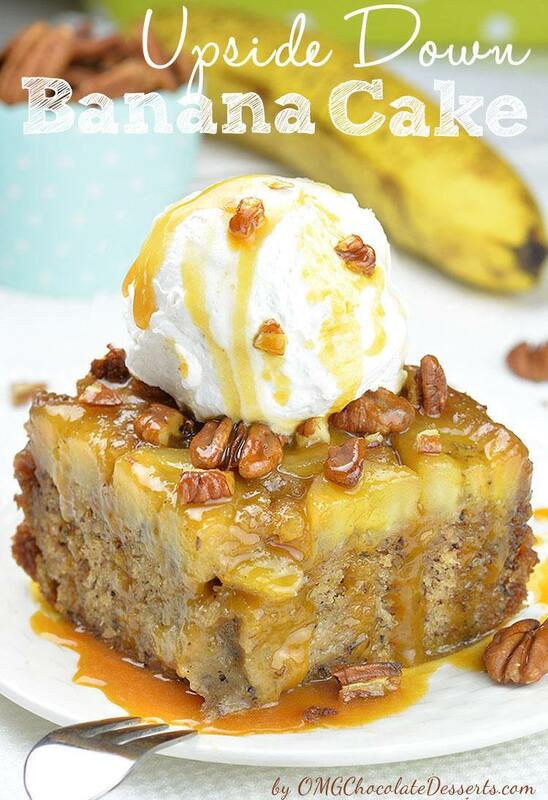 Banana bread is one of my favorite things to bake, and I love the idea of turning it into an upside down cake with a caramel glaze. Yummy! If I don’t choose to make it a skinny cake what do I need to do to make it a regular cake. My family won’t eat anything wheat. Hi Pam, substitute whole wheat flour with all-purpose flour. does this have to be stored in the refrigerator? I cook with what I have on hand. No trips to the store for needed ingredients (substitute)! Used ricotta cheese in place of heavy cream. White flour in place of wheat flour. Do I double it for a 9×13 pan ? Hi Julie,you will need to bake it longer if you double the recipe and use 9×13 pan. I used a bigger pan than what was recommended and it still over flowed. I’m confused.